Yufuin (由布院) is a famous hot spring village located in Kyushu, Japan. When we visited Yufuin in June 2017, the weather was rather hot, but we still went to visit a hot spring! We decided to have a day trip at Yufuin, and then travelled to Beppu. The accommodation at Yufuin is quite pricey, one night stay at a hot spring ryokan would cost us at least S$300 for our family! We took the sightseeing train Yufuin no Mori (ゆふいんの森) from Hakata Station, the train journey was an awesome experience! Read more about our experience on Yufuin no Mori here! Once we exited Yufuin Station, we deposited our luggage at the coin locker just outside the station. It cost around 600 yen for the size of our luggage. There are plenty of coin lockers around, and there is a luggage storage service shop opposite the train station, so no worries about lugging the luggage around! If you are staying in Yufuin overnight, that luggage storage service shop can help to deliver your luggage to your accommodation. The main attractions in Yufuin are Yunotsubo Kaido (湯の坪街道) and Lake Kirinko (金麟湖). 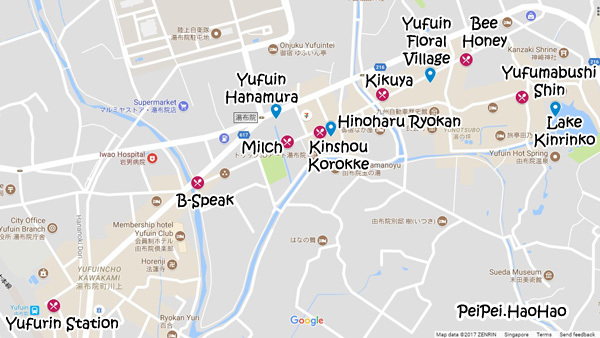 Good things must share - here is our very own Yufuin Must Eat and Must See Map! I have done some homework on which hot spring to visit in Yufuin, and I decided on Musuoen (山のホテル夢想園). This is located outside the map above - it is on a hill. We took a taxi from the train station, it took a few minutes and cost about 700 yen. Why did I choose this hot spring instead of those that are located within walking distance from the train station? It is because of this spectacular view at the hot spring! Musuoen is a hot spring ryokan which opens their public and private hot springs from 10 am to 3 pm for visitors who do not stay there. Remember to bring your own towels as they do not rent or sell them. What a lovely sight as we entered Musuoen! The changing room of the public hot spring for men looked very traditional! We walked a big round, and found that the first 3 private hot springs were occupied. We were really lucky to find that the last one was not occupied! I thought it was another blessing that the last private hot spring available was indoor type! Because it was 12 noon by the time we reached there! The amazing view as we stepped out of the indoor private hot spring. We walked past one of the outdoor private hot springs which was available then, but we decided to visit the public hot spring which had a much better view. After the relaxing bath, we asked the staff at the front counter to call a taxi for us, and we headed towards Yufuin town for lunch. The road was very narrow, I was glad that we took a taxi instead of driving! The restaurant where we had lunch was called Yufumabushi Shin (布まぶし 心), I got to know this restaurant from a Taiwanese TV variety show. They serve rice covered with chicken or unagi or Bungo beef in a ceramic container. There are two outlets in Yufuin, we visited the one near Lake Kirinko. The other one is located near Yufuin Station. I love the presentation of the appetizers! So lovely! Even though the restaurant was full, the food was served very fast! This is unagi mabushi. And this is Bungo beef mabushi. There are three ways of eating this dish. The first way is just have the meat and the rice. The second way is to add the ingredients (those on the red plate in the photo below) and the condiment, one of which is yuzu pepper, a special Japanese seasoning. The third way is to add the broth to the rice. Unagi and Bungo beef are delicious! We only ordered two sets because we needed some stomach space to eat other food later. And actually, the food there was a tad pricey, we spent more than 5000 yen (S$60+) on two sets! After lunch, we walked to Lake Kirinko. It was super crowded with tourists! The lake is actually quite small, so we left shortly after we had taken a we-have-been-there photo. We visited Yufuin Floral Village, which reminded me of Harry Potter. This small village has an European setting, and there are many shops that sell cute stuffs. As you see in our Yufuin Must Eat and Must See Map just now, there are many snacks along Yunotsubo Kaido! The children had ice-cream with honey from Bee Honey. DaDi and I had croquette (about 180 yen) from Kinshou Korokke (金賞コロッケ). We chose the one with beef, but we wondered where the beef was. If you have sweet tooth like me, you would be delighted to see a variety of sweet treats there! First, I had a dorayaki with pudding (about 200 yen) from Kikuya (花麹菊家). Then I had Milch pudding (300 yen) and hot Kase Kuchen (120 yen) which is baked cheese cake. So you can tell how full I was after eating so much! I had to give Snoopy Cafe and B-Speak (Swiss roll) a miss as my stomach couldn't take it anymore! Along Yunotsobo Kaido, there are some alleys that you can explore. We were not surprised to see Hello Kitty here. Look around and you would see interesting photo spots! The distance between Lake Kirinko and Yufuin Station is about 1.5 km. Instead of walking, there are other means of transportation. Yufuin is a nice place to enjoy hot spring and eat. The only down side is that it is crowded with tourists, and the public toilet is the dirtiest toilet I have ever seen in Japan. Bus: Nishitetsu Bus from Hakata Bus Terminal (reservation is required). Duration is about 2 hours. Fare - adult 2880 yen, child 1440 yen. Train: JR Sonic to Oita, then change to another train Nichirin Sea Gaia. Duration is about 3+ hours. You can consider visiting Beppu or Oita in between. Fare - adult 6650 yen, child 3330 yen. Hi Would like to try Musuoen onsen public bath too. Do you just go to the onsen or must you ring and book before you go ? Same here with a family of 4 I find the ryokans expensive but want to try the outdoor onsen. Hi, you do not have to book in advance, just walk in.